Guests look on as an outdoor wedding ceremony takes place at White Hawk Country Club in Crown Point, Indiana. Mike and Kelly had a gorgeous summer day for their outdoor wedding ceremony at White Hawk Country Club in Crown Point, Indiana. The gazebo was adorned with family mementos as they exchanged vows with family and friends looking on. 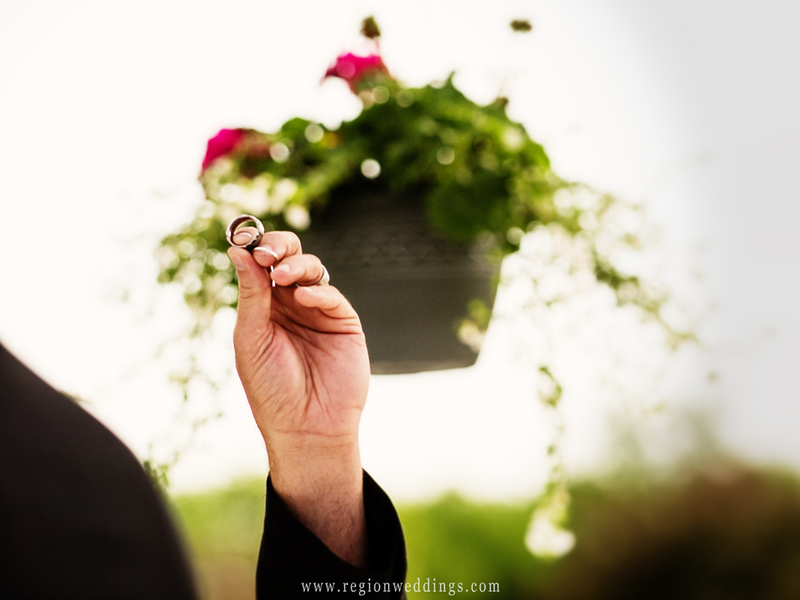 A pastor holds up the wedding rings at an outdoor wedding ceremony at White Hawk Country Club in Crown Point, Indiana. The bride and groom exchange rings during their outdoor wedding ceremony in Crown Point. Earlier that day, the bride and her bridesmaids along with her mom got ready in the upstairs loft inside the White Hawk building. It's always nice to have one stop for all the phases of the wedding day. Photos of details such as her pink garter with attached hearts were taken and then I met the guys on the golf course for some fun wedding photos. A pink garter with attached hearts is shown off on the leg of a bride. 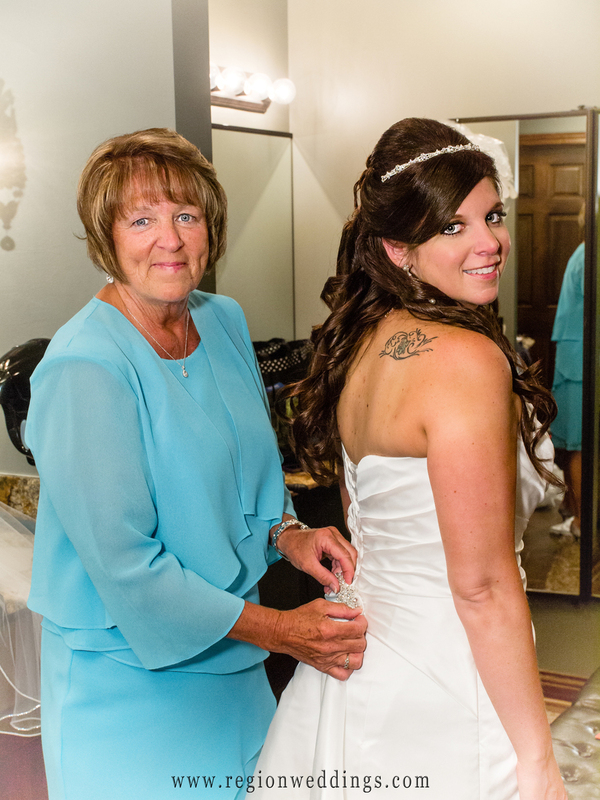 The mother of the bride helps her daughter into her wedding dress. We borrowed some clubs from members of White Hawk who were on the course at the time and took these fun wedding photos of the bride and groom being attacked by their wedding party. After the guys shots were done we brought out the bridesmaids for a bookend shot. The groomsmen attack the groom with golf clubs for this fun wedding photo at White Hawk Country Club. 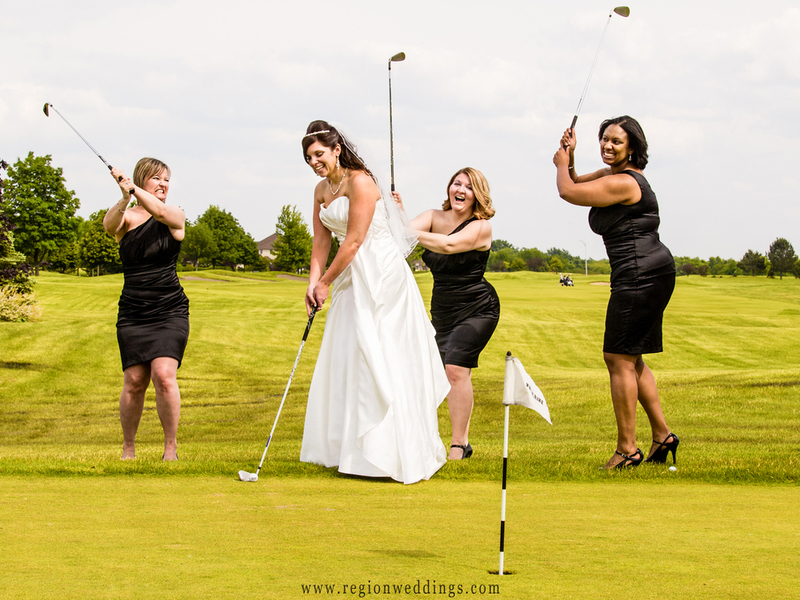 The bridesmaids attack the bride with golf clubs for this fun wedding photo at White Hawk Country Club. After the ceremony, the wedding party took the golf cart limousine and we took photographs deep on the golf course in various spots. Here is the newly married couple with spectacular sunburst in the sky. Bride and groom formal wedding photo on the golf course at White Hawk Country Club. I knew we were going to have a dancing crowd when I saw the couple had put out summer sandals for guests to grab. Let me tell you, these folks know how to have a good time, especially the grooms father who tore up the dance floor. I'm looking forward to having the rest of the images ready and see what fun one we got of Dad. Summer sandals for wedding guest to dance in at the reception. 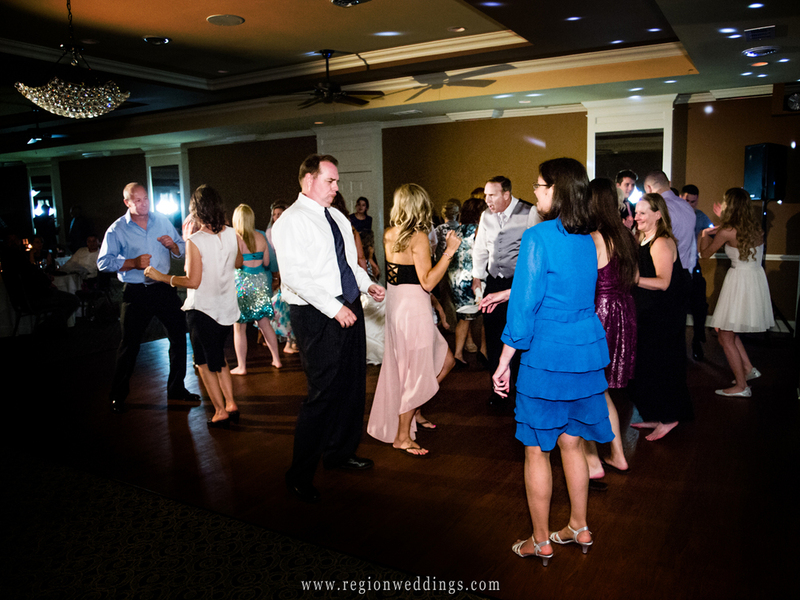 The dance floor at White Hawk Country club during a summer wedding reception. Thank you for viewing this sneak peek of wedding photos from Mike and Kelly's summer wedding at White Hawk Country Club in Crown Point. More to come in the next few weeks here and on the SBV Photography Facebook page. First dance for the bride and groom at White Hawk Country Club in Crown Point, Indiana.